Energy assessment of deep tunnels depends on the depth and what kind of ground they surrounded by .The numerical results showed that high static compressive stress concentration around the underground tunnel results in the accumulation of substantial strain energy at the same location. The roof and floor of the tunnel are more prone to dynamic failures during the blasting loading process. In addition, the analysis of energy dissipation indicated that the strain energy reduction and the residual kinetic energy are positively related to the lateral pressure coefficient and the burial depth of the tunnel, and the residual kinetic energy is much larger than the strain energy reduction under the same condition. Furthermore, for an underground tunnel subjected to high in situ stress, the blasting stress wave with lower amplitude is sufficient to trigger severe dynamic failures. Results indicate that a tunnel in saturated soil is more vulnerable to severe damage than that buried in either partially saturated soil or dry soil. 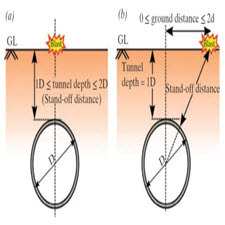 The tunnel is also more vulnerable to surface explosions that occur directly above the centre of the tunnel than those that occur at any equivalent distance in the ground away from the tunnel centre. In recent years, the exhaustion of mineral resources in shallow depths, and the rapid development of tunneling and hydropower engineering, have considerably motivated the tunnel excavations to extend to depth. However, due to the complicated geological environment in which deep excavations are carried out, a large number of unconventional rock failure phenomena such as spalling, zonal disintegration phenomenon and rock burst hazards have been observed during underground excavations. These accidents or hazards will bring about damages to equipment and delays of excavation operation, and even pose great threats to the safety of construction personnel. Therefore, it is an urgent issue to figure out the mechanism of the engineering disasters occurring in deep excavations .In practice, underground rocks and ores are naturally stressed by gravitational and tectonic stress. When an underground tunnel is excavated, the previous stress states existing in rock mass are disturbed, with the radial principal stress being released and tangential principal stress concentrating in the periphery of the tunnel. in this process, the strain energy releases at some locations while accumulating at other locations, which leads to different mechanical responses of underground tunnels under dynamic disturbance.In addition, during the underground excavation process, the excavation damaged zone (EDZ) is formed in the proximity of the excavated tunnel. To date, considerable research efforts were devoted to investigating the formation of EDZ and the fracture mechanisms of surrounding rock during underground excavations. ارزیابی انرژی تونل های عمیق بستگی به عمق و نوع زمین دارد که توسط آنها احاطه شده است. نتایج عددی نشان می دهد که تمرکز شدید استاتیک فشاری در اطراف تونل زیرزمینی موجب انباشت انرژی قابل توجهی در یک مکان می شود. سقف و کف تونل در طول فرآیند بارگیری انفجار بیشتر مستعد شکست های پویایی هستند. علاوه بر این، تجزیه و تحلیل از دست دادن انرژی نشان داد که کاهش انرژی قند و انرژی جنبشی باقی مانده به طور مثبت با ضریب فشار جانبی و عمق دفن تونل مربوط است، و انرژی سینتیکی باقی مانده بسیار بزرگتر از کاهش انرژی فشار در زیر شرایط مشابه علاوه بر این، برای یک تونل زیرزمینی که در معرض استرس زیاد در محل قرار دارد، موج استرس انفجاری با دامنه کم، کافی است که باعث شکستهای شدید پویایی شود. نتایج نشان می دهد که یک تونل در خاک اشباع بیشتر آسیب جدی نسبت به خاکی که در خاک اشباع شده یا خاک خشک وجود دارد، بیشتر آسیب پذیر است. تونل همچنین بیشتر به انفجارهای سطح که به طور مستقیم بالای مرکز تونل رخ می دهد، بیشتر آسیب پذیر است نسبت به مواردی که در هر نقطه معادل در زمین از مرکز تونل رخ می دهد. در سال های اخیر، خستگی منابع معدنی در عمق کم عمق و توسعه سریع تونل زنی و مهندسی برق آبی، به طور قابل ملاحظه ای باعث کاوش های تونل شده تا عمق آن را افزایش داده است. با این حال، با توجه به محیط زیست پیچیده زمین شناسی که در آن حفاری های عمیق انجام می شود، تعداد زیادی از پدیده های غلط غیر معمول از قبیل زلزله، پدیده تجزیه زون و خطرات انفجار سنگی در حفاری های زیرزمینی مشاهده شده است. این حوادث یا خطرات باعث خسارت به تجهیزات و تاخیر عملیات حفاری می شود و حتی تهدیدات جدی برای ایمنی کارکنان ساختمانی ایجاد می کند. بنابراین، مسئله فوری برای تشخیص مکانیزم فجایع مهندسی در حفاری های عمیق است. در عمل، سنگ های زیرزمینی و سنگ های معدنی به طور طبیعی توسط استرس گرانشی و زمین شناسی تحت تأثیر قرار می گیرند. هنگامی که یک تونل زیرزمینی حفاری می شود، تنش های قبلی موجود در توده های سنگی آشفته می شود، با استرس اصلی شعاعی که آزاد می شود و استرس اصلی مماسی در حاشیه تونل تمرکز می کند. در این فرآیند، انرژی کرنر در برخی نقاط آزاد می شود و در حال جمع شدن در نقاط دیگر است که منجر به پاسخ های مکانیکی تونل های زیرزمینی در اثر اختلالات دینامیکی می شود. علاوه بر این، در طول فرایند حفاری زیرزمینی، منطقه آسیب دیده حفاری (EDZ) نزدیکی تونل حفاری تا به امروز، تلاش های تحقیق قابل توجهی برای بررسی شکل گیری EDZ و مکانیزم شکستگی سنگ اطراف در طی حفاری های زیرزمینی اختصاص داده شده بود.